Get to know our Wine Specialist, Bob! You are here: Home / Blog / Get to know our Wine Specialist, Bob! Our wine specialist, Bob Van Hoy, has been collecting wine since 1988. He actually possesses a large wine vault where he keeps his fine collection! Bob has always had an interest in wine. He previously worked at a winery and understands the value of great wine. Recently Bob has been changing a lot of things in our wine department. According to Bob he wants to bring in more quality and value wine labels to the store. He wants our customers to have access to higher end wines without having to travel far and wide. 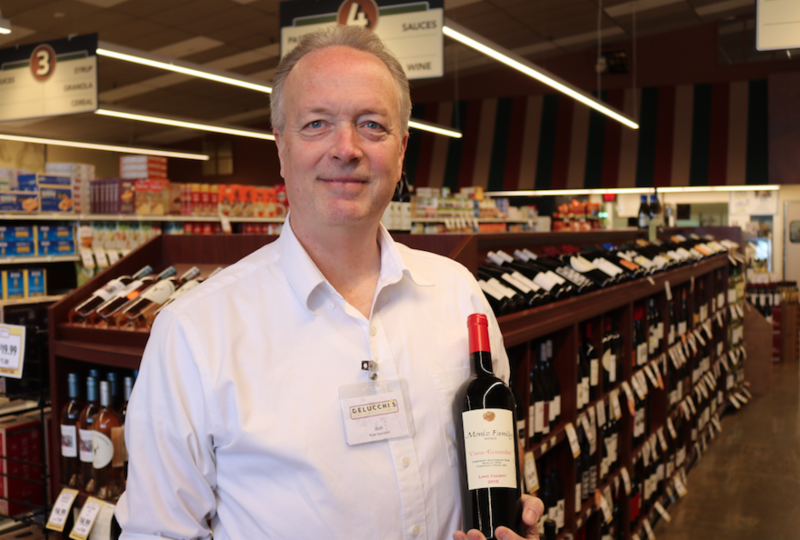 “I want people in the neighborhood to come in to Delucchi’s and be able to get quality wine, but the bottom line is what the customers want!” – Bob V.
Do you need a wine recommendation? Just ask Bob! He loves recommending wines for Birthdays, anniversaries, meals, company presents, and so on. He will even tell you what meals go best with wine varieties. Come on in, talk to Bob, let him know your wine budget, your taste, and what event or occasion you’re shopping for and he will gladly tell you what wine will best suit your needs! It breaks tradition and delivers a competitively priced wine that stands out on the shelf. It is an artistic and edgy expression that is meant to be shared… but is not afraid to stand alone.Red Blend. Full bodied, with aromas of spice and blackberry. Flavors of toasty oak, cherry, and raspberry with lingering tannins, balanced and smooth. Black Ink Red Blend pairs well with hamburgers, roasted chicken with vegetables, or whatever you like. No rules. Freemark Abbey’s essence is steadfast, decidedly not trendy. Through their unwavering commitment and pedigreed approach to winemaking, they’ve earned the reputation of consistently elegant, classically structured, refined wines. Their Cabernet Sauvignon is mixed with aromas of dark cherry, ripe Santa Rosa plum and black currant are integrated with the spicy sweetness of oak, cedar, cinnamon and clove. The blend of five different clones of Pinot Noir from five separate blocks of our Edna Ranch estate vineyard combine to create a refined and balanced Pinot Noir. With each vintage, the blends change creating a unique wine with exceptional depth and complexity. This wine was aged for 11 months in French oak barrels with approximately 30% of them being new. Deep red cherry color that welcomes the senses with aromas of red raspberry, cherry cola, tobacco, and dried eucalyptus leaves along with notes of mint and cinnamon. Inviting flavors of black plum, red currant and dried red cherry layered over notes of forest floor, grilled meats and white pepper on the finish. This wine features a rich mouthfeel along with balanced acidity and a refined tannin structure that lingers on the finish. We will be selling splits/half bottles of wine! The world’s first plant-based burger now available at Delucchi’s!Come join us for a FREE wine tasting event!